Welcome to Kyrgyzstan | I should have turned left! 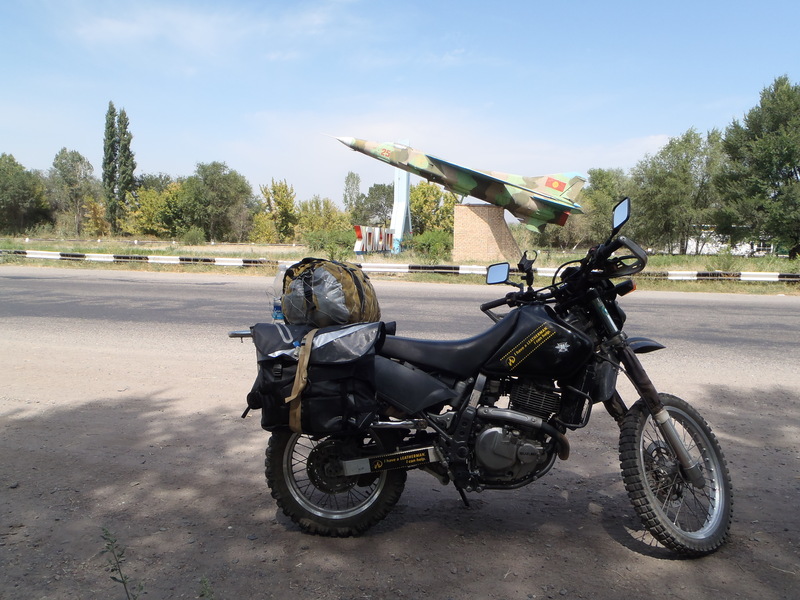 After finally arriving in Almaty in Kahazakstan I spent a week trying to find a suitable and very inexpensive bike. My friend Richard hooked me up with a local guy Anton who was yet another Russian angle. He was a great help and really nice guy. He arranged for me to see 3 bikes two of which were really great in absolutely mint condition but there was no way I was comfortable on either of them with regards taking them off-road. They were a Suzuki Freewind and a Kawasaki KLE, nice bikes if I was travelling 100% on tarmac, but just too heavy and cumbersome for off-road. The 3rd bike a Suzuki DR650 was perfect I liked riding it a lot BUT it was in bad condition and expensive at usd3800. I had a really bad gut feeling about this bike with regards the fact that this guy did not look after it so I wondered just what condition the engine was in on the inside, and decided against the bike. At the same time I was posting to the Horizons Unlimited forum about these bikes and received an email from Chris Smaborski. Saying that he has a 1997 Suzuki DR650SE in Bishkek that I could buy and that he’d buy back from me if/when I got to Singapore. FRACKING HELL what a guy, so we chatted and have subsequently become friends one I will certainly make an effort to see in Poland. I bought the bike and am now in Bishkek with it, and I love it and have called him Dozer. Now it’s just a matter of getting a luggage system for the bike and bigger tank (it only has 13l tank) her again Chris came to the rescue. He has another DR6540 in Kyrgyzstan which his friend is riding. I can take the tank, luggage system and all spare parts from this bike as soon as Karst arrives in Bishkek on the 23rd. WOW things are looking up. Tomorrow Richard arrives in Bishkek and on Tuesday we’ll travel around the biggest most beautiful lake in Kyrgyzstan, and then get back to Bishkek to meet Karst. On the 26th we meet the rest of the china group and head to china, Mongolia back through china and finally Laos. Where I’ll leave the group and head off alone. One thing I did while in Almaty was had my first couch surfing experience. I stayed with a Russian lady Yulia and we had a great time together. I so enjoyed couch surfing that I am doing it again in Bishkek and staying with a German lady who is teaching English here. This is a great way to meet people living in the city either foreigners or locals and I highly recommend it.